1) 1. 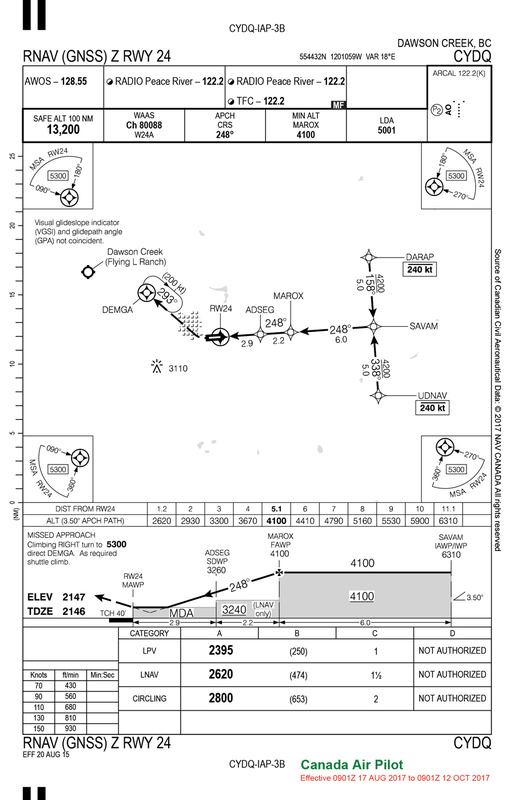 Identify the fly-over waypoints within this procedure: _____; _____. 2) You are cleared for the straight in RNAV RWY 24 approach and are cleared direct to the DARAP waypoint. What would be the correct lateral and vertical profile for this approach after crossing DARAP? It is daytime and +10 degrees C at the time of the approach. DARAP to SAVAM AT 4200; SAVAM to MAROX at 4100; intercept LPV G/P at MAROX and fly down to Decision Altitude of 2395 ASL. 3) What is the distance between the FAWP to the MAWP? 4) You are flying the LNAV approach via CDFA technique. You are level at 4100 ASL. At what point do you initiate descent and what should be the optimum crossing altitude over ADSEG? Initiate descent at MAROX; 3260 ASL. 5) If your groundspeed on the approach was 110 knots, you would require a minimum descent rate of ____ FPM to meet this target. 6) What is the clearance limit of this approach and what action should be taken upon arrival if further clearance is not received? DEMGA; Hold/shuttle as published and be at 5300 prior to proceeding on course.